The integration of clinical trials into FCI is essential both as an end point of drug development and as a starting point for research on response and resistance mechanisms. The aim is to initiate such studies in close cooperation with the University Cancer Center (UCT). UCT Frankfurt has been continuously working on the development of a comprehensive clinical research unit, which will be fully available to the FCI. The practical implementation of early translational studies at the FCI site is guaranteed. Of particular importance to the FCI are the clinician scientists in Research Area 5, which are organized in multicenter study groups for therapy optimization. They assist the FCI project groups with questions of clinical relevance and cover a broad spectrum of indications (gastric, rectal, mammary and lung cancers, brain tumors, acute lymphocytic and myeloid leukemias, multiple myelomas, lymphomas). The study groups have developed important milestones to treat the respective disease, advise hospitals beyond the university clinics, and are essential multipliers and strategic partners in the clinical implementation of the FCI’s work and in planning the research strategy in the FCI. At UCT Frankfurt, there is a complete clinical data collection from all patients who have been first diagnosed since 2012 and have been treated at the UCT (around 10,000 patients). Biomaterials are available from patients whose tumor material has been studied in the pathology department. Moreover, there is fresh frozen material from more than 8,000 patients. The bone marrow biobank in which vitally frozen bone marrow of leukemia patients is stored is also connected to FCI. Since 2016, the Georg-Speyer-Haus has been involved in the establishment of an organoid biobank of patients with colorectal carcinoma (see Research Area 3). 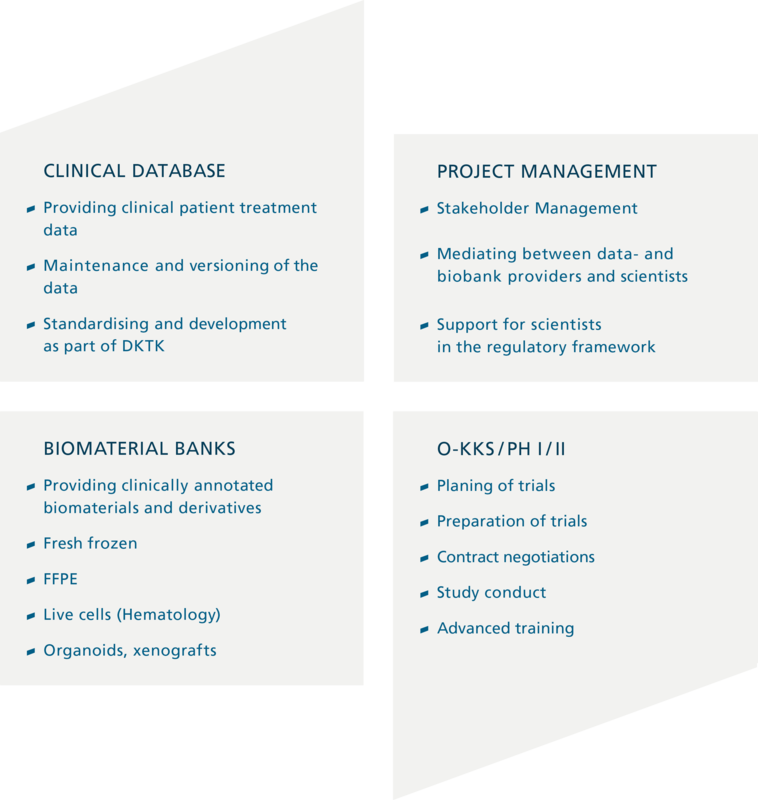 A central access system and a project management team enable scientists to use these resources efficiently through the Clinical Communication Platform. In addition, the Oncology Coordination Center for Clinical Trials (O-KKS) at UCT has a central unit that supports the FCI with all aspects of self-initiated studies. There is extensive experience in the coordination of academic studies of all phases; in a Phase I / II study unit, specialized staff carry out complex study therapies, including first-in-man studies. Research Area 5 Clinical Trials is led by Hubert Serve, FCI Co-Founder and Director of Medical Clinic II. This area is significantly reinforced by the newly established W3 Professorship for Experimental Therapy and a W2 / W3 Professorship (TT) for Molecular Mechanisms of Tumor Diseases. An important advisory role is played by all clinical scientists who are organized in multicenter study groups for therapy optimization. Saleh Al-Batran (gastric carcinoma / GGG), Claus Rödel (rectal carcinoma / GRCSG), Nicola Gökbuget (acute lymphoblastic leukemia / GMALL), Oliver Bähr (brain tumors / NOA) and Hubert Serve (acute myeloid leukemia/ SAL)) fulfill a leading role in these committees. In addition, Frankfurt scientists are involved in study groups for breast cancer, lung carcinoma, lymphoma and multiple myeloma (DSMM, GMMG).